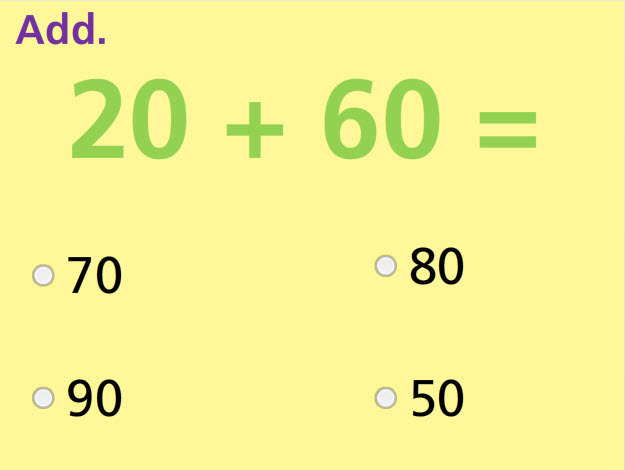 Add multiples of 10 in this fun online math test. By getting immediate feedback as to how well the student does on this test, areas of improvement can be identified for additional help. This test provides feedback about how well the student understands adding multiples of 10. The seven multiple-choice questions and three drag-and-drop questions provide additional chances for the student to develop their addition skills in the early elementary grades. Return from this Add Multiples of 10 Math Test to the Elementary Math Tests , 2nd Grade Math Tests webpage, or to Math Tests.